As a developer, I don't like to decide which configuration options are important. As a user I (personally) want to have full control over all program-and plugin settings. Nothing annoys me more in other applications than features, which could easily achieved by the backend, but they are not supported in the frontend. The downside of this approach is simple: For an average user, the gmerlin applications are way too complicated. And of course, for me it's also annoying to tweak that many parameters all the time. Now, since I reach a one-zero version, It's time to look at such usability issues. A configuration dialog can contain of multiple nested sections. If you have more than one section, you see a tree structure on the right, which lets you select the section. A section contains all the configuration widgets you can see at the same time. Therefore the code must always distinguish if an action is for a section or for the whole dialog. Most configuration sections now have a button Restore factory defaults. It does, what the name suggests. You can use this if you think you messed something up. Some configuration sections support presets. You can save all parameters into a file and load them again after. In some situations, presets are per section. In this case you see the preset menu below the parameter widgets. 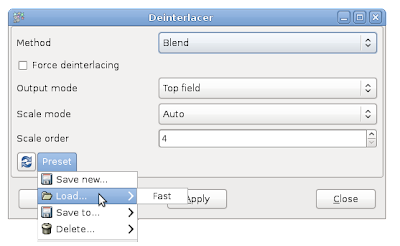 If the presets are global for the whole dialog window, you see the menu below the tree view. 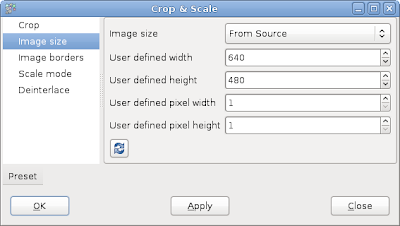 The next image shows a single-section dialog with the preset menu next to the restore button. 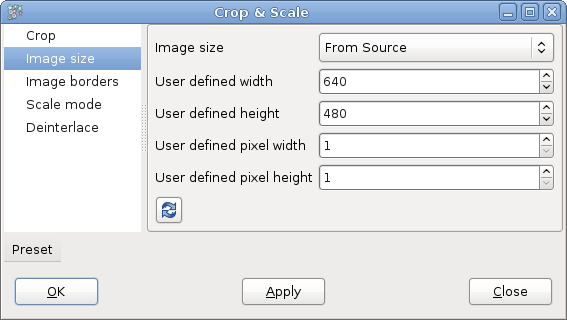 The next image shows a dialog with multiple sections. The preset menu is for the whole dialog, the restore button is for the section only. There is no reason, not to support presets for other configurations as well. Suggestions are welcome.